This dress is gorgeous, can't believe it sat in the sale for a month! I love the dress, you look gorgeous. The pearl colour is just beautiful. Love your bag, beautiful outfit! that dress is so pretty and I love your silhouette necklace. i get blogging doubts all the time, sometimes it all feels so silly but hey it's fun most of the time. oh my goodness, you are beautiful! this outfit is totally gorgeous, i love the dress and your super super pretty pearl collar! pure prettiness in an outfit, i'm in love. Hello Charlie, I just wanted to say that whilst I only discovered your blog a few days ago, it has to be one of my favourites. But yeah, before I start to ramble, I was sad to hear that you felt that way about your blog, because you have super gorgeous clothes and accessories, and you're really pretty. I hope you continue to post because it would be a great shame otherwise. 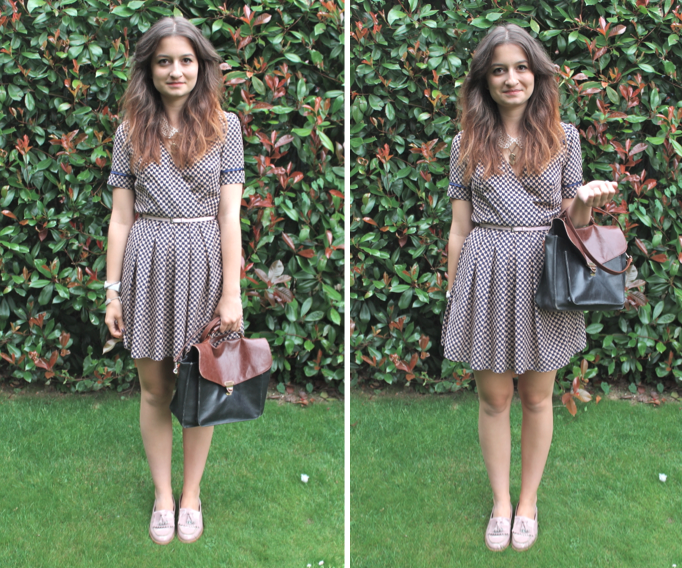 I did have a question: Do you think it's ok to re-wear items on your blog? a new, loyal follower who is still plucking up the courage to even think about writing a blog. that dress is in such pretty colours! and i love your loafers & belt together too. hope you're having an amazing time in NY!